Edutopia.org's Project-Based Learning professional development guide can be used for a two- to three-hour session, or expanded for a one- to two-day workshop, and is divided into two parts. Part one is a guided process, designed to give participants a brief introduction to project-based learning (PBL), and answers the questions "Why is PBL important? ", "What is PBL about? ", and "How does PBL work?" 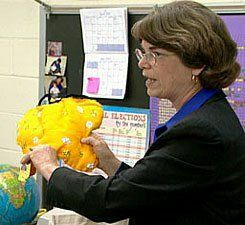 Students Follow the Butterflies' Migration: Teacher Frances Koontz shows students a symbolic butterfly sent from children in Mexico. Continue to the next section of the guide, Why Is PBL Important? Acknowledgments: This module was written by Sara Armstrong and Marian Shaffner. The George Lucas Educational Foundation extends its thanks to the following people who reviewed it for content and usability: Peggy Benton, assistant professor, PT3 grant director and adviser, Department of Instructional Technologies, San Francisco State University, San Francisco; DiAnn Ellis, professor, Department of Education, SFSU; David Pownell, assistant professor, Department of Education, Washburn University, Topeka, Kansas; Tina Barrios, supervisor of instructional technology, Manatee County Schools, Bradenton, Florida; Donna Read, associate professor of education, Florida Atlantic University, Boca Raton, Florida; and Bruce "Chip" Daley, coordinator of research, development and special projects, Clark County School District, Las Vegas.